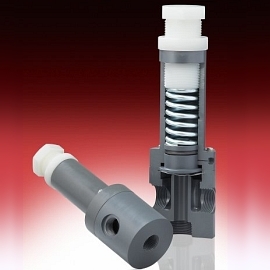 3-Way PTFE Diaphragm – Plast-O-Matic Valves, Inc.
Series TRVDT is a high flow relief/by-pass valve with 3-port design, ideal for applications where minimal footprint is required or where use of a piping tee is impractical. Valve has a straight-through flow pattern when closed. When set point is exceeded, the diaphragm is lifted off the center port, and excess flows ìdownî and out through the third port at the bottom of the valve. 1/2″ – 1″ sizes in most popular thermoplastic materials and connections; 5 – 125 PSI set range.